The 1970’s and 1980’s: Fantasy Movie Heaven! 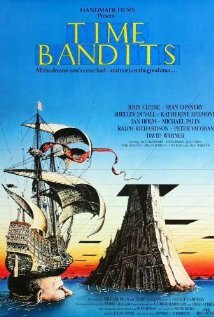 A unique blend of fantasy/sci-fi and generally oddity, Time Bandits is film from the creative mind and unique style of Terry Gilliam. Gilliam was first known as the animator from Monty Python’s Flying Circus. He then went on to a very successful and idiosyncratic directing career which include: Monty Python and the Holy Grail, Brazil, Twelve Monkeys, The Fisher King, Fear and Loathing in Las Vegas, The Brothers Grimm and the Imaginarium of Doctor Parnassus. In several of his films certain common motifs or themes are explored for the viewer: sane main characters surrounded by a world of insanity (or fantastical), absurdism (theater of the absurd), government/democracy/bureaucracy, childlike wonder of the surrounding world, etc. In Time Bandits there is a little bit of all of that in the film, along with plenty of laughs, bizarre visuals and a story line and universe that blends fantasy, reality and science fiction. I choose this film because I felt it provided an entirely unique perspective on what a fantasy film is along with being simply a great entertaining movie. Side note: Sean Connery has an awesome and somewhat hilarious role in Time Bandits! 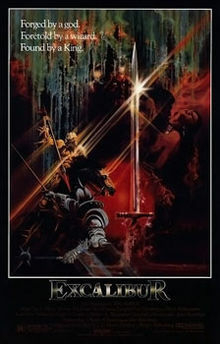 Next on our list is Excalibur, which provides the viewer with perhaps the most complete film telling of the story of the Knights of the Round Table, right along with Monthy Python and the Holy Grail of course, though perhaps a few liberties were taken there 🙂 Directed by John Boorman (Deliverance, Zardoz) is unique in the sense that it received an R rating for its release. Generally, fantasy films tend to be PG or PG-13, especially recently with fantasy blockbuster films and studios needing to reach the largest audience possible for sales. However, the late 1970’s and 1980’s had a few examples in the fantasy genre receiving R ratings for the presence of violence, language and/or sexuality – the first Conan film received an R rating. Anyway, let’s not get hung up on this as the only description of Excalibur. In addition to providing the most complete Knights of the Round Table film depiction, Excalibur does it while showcasing a stacked cast of bombastic British and Scottish actors. Patrick Stewart, Gabriel Bryne and a young Liam Neeson all have roles in Excalibur and provide some pretty energetic, larger than life performances. Overall, Excalibur gives a complete, though dark and sometimes bizarre portrayal of the Knights of the Round Table. Its another unique fantasy film worthy of viewing. Before Peter Jackson there was Ralph Bakshi. Wait, who? Ralph Bakshi was the director and animator for the original 1978 Lord of the Rings film. For millions of Tolkien fans out there longing for a movie version, for a long time the animated films were the only game in town. In many ways, the animated films are great adaptations and very fun to watch. There is a little confusion regarding the animated films though. There are three animated films from the late 1970’s and early 1980’s that depict the LOTR trilogy as well as the Hobbit. 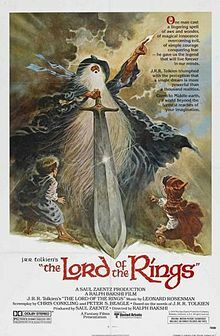 The first film to be produced (The Hobbit 1977) and the last film (The Return of the King 1980) were actually made by a different director (Jules Bass and Arthur Rankin Jr.) and had a very different style and substance. Further confusing things, Bakshi’s Lord of the Rings only covers the plot from the first two books of LOTR. Unfortunately, United Artists and Bakshi seem to have had a falling out and thus he did not make the 2nd film. Hurriedly, the final Return of the King was made by Bass and Rankin, which disappointed fans and completely changed the tone Bakshi had set. However, Bakshi created a very interesting interpretation of LOTR and followed the plot rather faithfully. He created a darker world than the other two animated films and used interesting style and techniques (rotoscoping included) to create the film. There are many who are frustrated that he did not make the 2nd film, and more still that did not necessarily like his animation style. However, I think that this is perhaps almost a MORE faithful adaptation than Jackson’s (there are more than a few problems despite the quality) and one that is unique enough to garner a view.